Snapchat’s parent company Snap may be in the fiscal shitter, but Snapchat’s still an incredibly popular app: Last we heard, 187 million people (teens) use it daily. 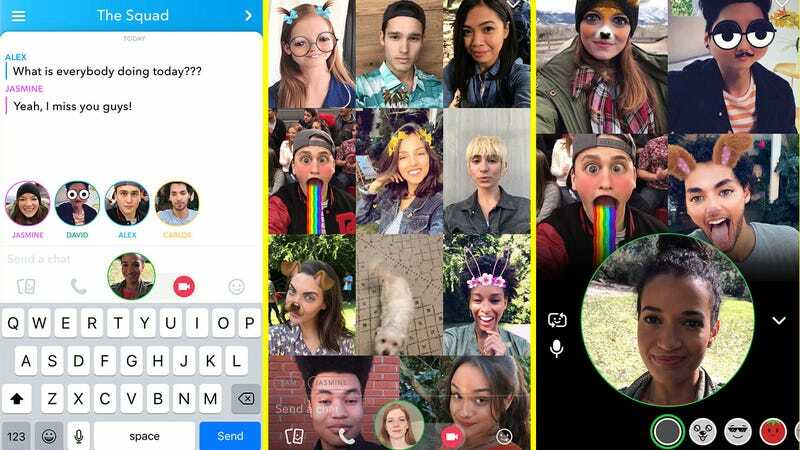 For those folks, as well as Instagram’s uninspired product team, Snapchat is adding a new group video chat feature akin to what’s already available on WhatsApp and Skype. Snap says it’s rolling out the feature worldwide starting today, though it wasn’t yet live for us. With it, users can initiate a group video chat by hitting the red video camera button above the keyboard, which will prompt others to join, if they so choose. In a few weeks, we can almost guarantee Instagram will do the same, although the company already offers a similar live-streaming feature for groups.